When I was three years old I was very nearly killed by police. At that age, I was fascinated with the ordinary objects I collected on the sidewalks by our co-op—rubber bands, washers, broken toys, and, when I was lucky, curios of even more exotic extraction. I fastened these odds and ends to collages at my preschool. Even then, the connection between what happened in the sometimes dangerous streets of our neighborhood and the more privileged spaces of school and home was evident. One morning, walking to preschool with my mother, I was very nearly killed by police. I’d stopped to pick something (the discarded loop of a broken key chain, maybe) up off the sidewalk outside a corner store. Had I stooped a few inches closer to the sticker-smattered door of the bodega, I would have been killed or maimed. Without warning, the door was kicked open, coming within inches of my blonde curls. A police and his partner had arrested a man for taking food without paying, and in order to make a dramatic exit, had kicked open the door as hard as he could. 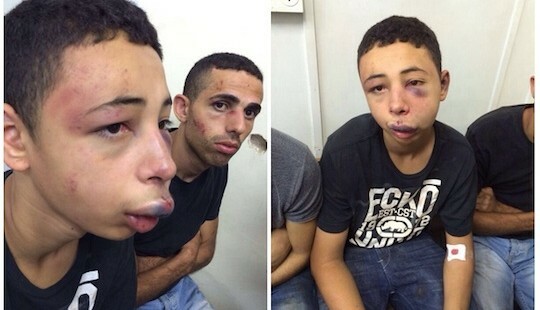 Tariq Abu Khdeir, 15 has returned home to Tampa after being brutally beaten by Israeli Police. “You almost killed my son!” my mother screamed. His statement was true, though not in the way he meant it, of course, and equally deadly. While the accidental police killing of a three year old middle class Jewish boy pales in comparison to the deliberate, systematic oppression of more vulnerable people by police, it surely would have garnered heavy condemnation of policing tools like excessive force, zero tolerance, and broken windows theory. There would have been an outcry, the officer would have lost his job, and modest reforms connected to the standard operating procedures of arresting nonviolent suspects would have been put in place—the very sort of actions less privileged communities call for every time one of their daughters or sons is killed by police and rarely, if ever, achieve. In making this Jewish call to action against police brutality, I won’t cite the Torah or Talmud. While there are numerous tracts in these texts which would support such a campaign, there are others that extol obedience to authority and the necessity of violent force to achieve one’s goals. I will cite, however, the long history of oppression of Jews by governments near and far, and the enforcement of that oppression by police. From the Warsaw Ghetto to the Lower East Side tenements, from slavery in Egypt to torture in Argentina, Jews throughout history have resisted repression. Our history as an oppressed tribe commands us to be allies with marginalized people in our contemporary society, to follow their lead in demanding and building a more just society. In the last six or seven decades, many of our families have risen from their humble origins to positions of privilege. This rise obscures our historical perspective and scrambles our moral GPS. While there will always be a world of crises competing for our energy, focusing on the rash of police brutality, present in Baltimore as it is elsewhere, by joining the fight against police brutality makes sense; we are most able to affect change where we live. As Jews, we must remember when police came for us and refuse to tolerate even one more killing by police. By acting on our Jewish historical memory, we can work with our neighbors to build real justice in the new year. Shana Tovah. Tizku l’shanim rabot. Gut Yontiff.